Gum problems can be caused by the build up of plaque bacteria and tartar along the gum line. 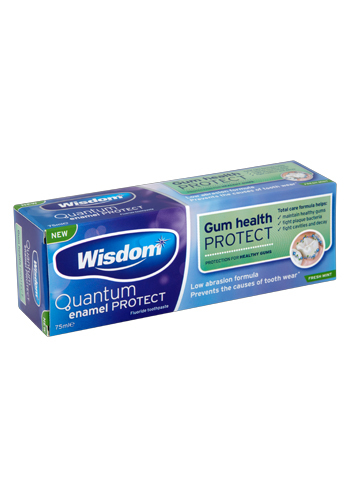 Wisdom Gum Health Protect total care toothpaste has been specially formulated to help fight plaque bacteria and tartar build up, to help maintain healthy gums. 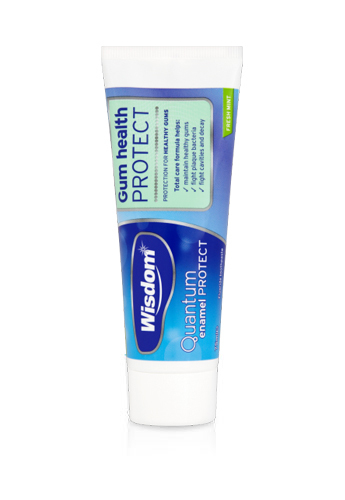 It also has a unique blend of ultra low abrasion MICRO-CLEANING granules and fluoride to help ensure excellent cleaning without tooth wear. Ingredients: Sorbitol, Aqua, Hydrated Silica, Sodium Lauryl Sulfate, Sodium Monofluorophosphate, Aroma, Cellulose Gum, Triclosan, Sodium Saccharin, Mica, Silica, CI 77891, Cl 74160, Cl 18965, Cl 42051.